Probably my oldest working game. 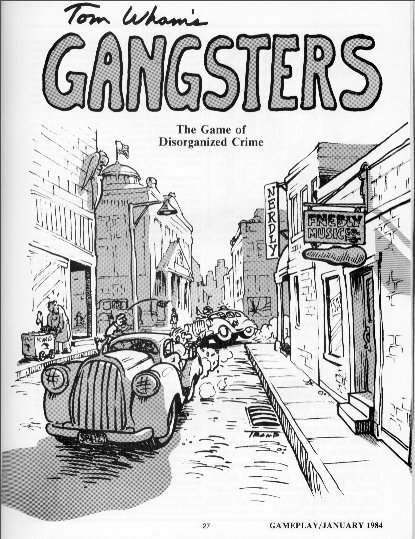 Gangsters grew out of the group of friends who used to play games in my basement in the late 50's and early 60's during my high school days. As time went by, I kept updating and revising the game, until, at last, in 1984, it finally reached print (albeit modestly) in Jake Jaquet's short lived GAMEPLAY magazine. The cover art was done by my good friend and brother in law, Dave Trampier (some of you might remember Wormy from the early dragons). Wormy fans, please note: Dave and I last communicated in 1982, he still exists somewhere in Illinois, I think, but I do not know how to get in touch with him. Sorry.